I am thrilled to announce that my longtime boyfriend, Chris, and I are finally getting married! After eight years together, this milestone may appear to be a bit overdue, but I'm excited all the same. We have survived two years long distance, two separate career changes (both my own), five moves in three cities and two states, a masters and a doctorate degree, my first years as a high school teacher (when I rarely emerged from my work), buying our first home together, and all of the small and big moments in-between. There are two types of marriages: cornerstone and capstone. A cornerstone marriage is one in which the marriage is the starting point, and together a life is created from that point on. A capstone marriage is one in which the marriage is the "capstone," or icing on top, to celebrate a life that has already been built together. Our engagement story differs from most—less romance, more practicality. We have both felt married for so long already that the actual ceremony feels more like a formality. I suppose you could say we fall firmly into the "capstone" marriage model. Sitting on the couch after dinner on a weeknight, the topic of marriage arose. We should probably get married, shouldn't we? Yeah, I think we should. But when? From there, a wedding date was set for two months later, and the rest of the planning very quickly fell into place. We are having a private outdoor ceremony in our favorite arboretum with family, followed by a nice dinner at a local restaurant. I'm still not sure how we were able to find a ceremony and reception venue, photographer, officiant, and wedding dress within a week for one of the busiest wedding weekends of the year, but I am grateful. A week later we will celebrate in my hometown with friends and extended family. With everything falling neatly into place, it feels like it was meant to be. With nearly three weeks left until the big day, there are still dozens of small details to sort out. Instead of letting myself get overwhelmed with the planning, I'm trying to tackle one detail at a time. For the reception, I'm ambitiously planning to bake my own cupcakes to share. While I baked hundreds of cupcakes for my sister's wedding reception a couple years ago—vanilla bean, chocolate, coconut, and dulce de leche—it's a different feat to do it for my own. However, with my own dairy intolerance to manage, I find the dairy-free options from local bakeries lacking both in flavor and texture. So, into the kitchen I must go. These chocolate espresso cupcakes are a flavor I wanted to give a spin before the big day. Chris and I adore the flavors of chocolate and coffee, so it feels natural to bring them together in this cake. The cupcakes are infused with chocolate by adding espresso powder and strong coffee to the batter. The frosting is made by mixing strong coffee into semisweet chocolate. The cupcakes are not overly sweet, instead focusing on the deep chocolate and coffee flavors. I topped the finished cupcakes with toffee pieces, but any type of sprinkles will work here (or feel free to keep them plain). Enjoy alongside a cup of coffee or tall glass of milk! In a mixing bowl, whisk together the flour, sugar, cocoa, espresso powder, baking soda, and salt. Add the vanilla extract, oil, 1/2 cup strong coffee, and milk. Using a spatula, mix the batter until smooth. To make the chocolate espresso frosting, place chopped chocolate into a mixing bowl. Warm the remaining 1/2 cup strong coffee to boiling and pour over the chocolate. Allow it to set for 5 minutes then stir until smooth. Allow frosting to rest in the refrigerator, stirring occasionally, until it cools and thickens into a spreadable consistency (anywhere from 30 to 60 minutes). Place frosting in a pastry bag (or plastic bag with the corner cut out) and pipe frosting onto the cooled cupcakes or spread frosting with an offset spatula. My grandmother recently passed away. After a two and a half year long battle with cancer, it was expected, but it was still difficult for my family to say goodbye. Can you truly prepare yourself for losing someone you love? My grandmother was such a strong figure in our family, both humble and hardworking. She will be greatly missed. During my childhood, my sister and I would spend our winter breaks on my grandparent's farm. Our early mornings were occupied by painting ceramic figurines, using leftover paints from my grandmother's days of painting alongside The Joy of Painting with Bob Ross. Our afternoons were spent building snow caves in the large snow drifts in the yard. When we could no longer feel the tips of our noses, we ran inside to be greeted by my grandmother's handmade quilts, hot from the dryer. In the evenings, we would cuddle up in the same bed and she would read us books. Even when we grew too old for bedtime stories, we would insist anyway, enjoying the familiar tales of Rabbit and Skunk, and the silly voices my grandmother gave the characters. Most significantly, my grandmother passed down her love of baking to me. Since I was very young, I watched her create complex German meals from scratch: kneading bread dough to make buns, rolling out dough for strudels, whipping the filling for her chocolate pudding pies. As I grew, she taught what she knew about food. As a dedicated home cook, she opened her kitchen to me, letting me work alongside her. She was a no-fuss kind of woman, never minding when I accidentally ripped holes in the strudel dough or flip the frying "shoop" noodles too soon. Instead, she would guide me to do better on the next batch. In many ways, she laid down a foundation of knowledge on food, helping me discover my love and passion for baking. When I learned of my grandmother's passing, I pulled my personal cookbook off the shelf, filled with her handwritten recipes. I paged through the book, pausing on each recipe, remembering the moments we shared making and eating those dishes together. The last recipe in the book was her recipe for chocolate cupcakes, the memories of which made me laugh. My grandmother was known in our family for her chocolate cupcakes, which appeared at every holiday and family gathering. It was general knowledge that her cupcakes had a secret ingredient. My sister and I would constantly beg and plead her to tell us the secret, but her response was always the same: when you grow older. Finally, when I reached my fourteenth birthday, I was deemed old enough. She took me aside and whispered the name of the mystery ingredient—a good cup of strong coffee—and told me I wasn't to tell a soul. I happily lorded this secret over my younger sister for years. I made her chocolate cupcakes on that sad morning, hoping to keep the memories of my grandmother close, baking them to share with my grieving family. I'm sharing her recipe—and secret ingredient—with you today. Above all, my grandmother believed food creates community; food is what brings us and binds us together. Food is love. Our recipes tell the stories of our love. 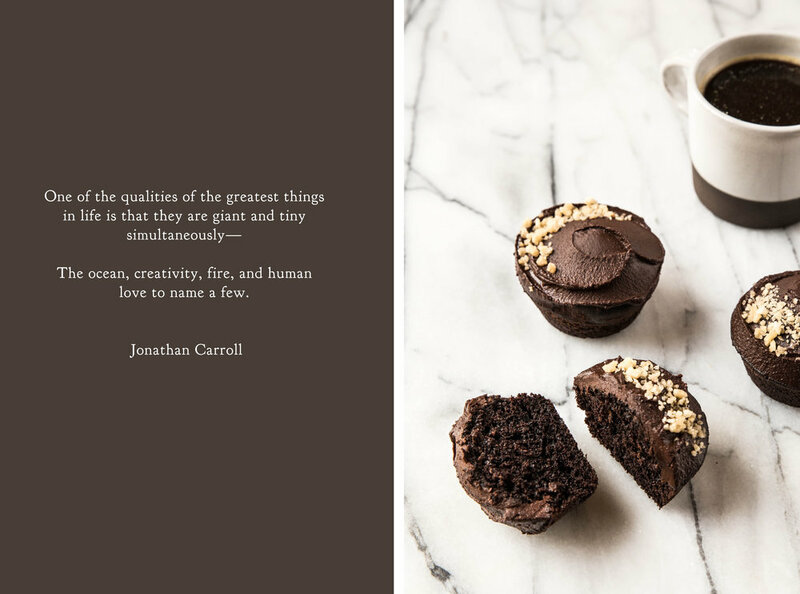 When you find a moment, bake and share these cupcakes with your loved ones. Create moments to remember and hold dear long after the cupcakes have disappeared. My grandmother's chocolate cupcakes have a chocolate base reminiscent of a moist, stick-to-the-roof-of-your-mouth devil's food cake. The frosting is cooked down on the stove, made with butter, sugar, marshmallows, and chocolate chips. After the frosting cools down and is whisked for a lighter texture, it's spread onto the cupcakes. My family prefers to eat the cupcakes straight from the refrigerator, where the frosting is firm and chilled, but feel free to serve them at room temperature based on your own preference (though my father will disagree with your decision on this). Preheat oven to 350 degrees F (180 degrees C). Line a cupcake pan with liners. In a large mixing bowl, whisk together vegetable oil, egg, granulated sugar, and buttermilk until uniform. Whisk in flour, cocoa powder, baking soda, and salt alternatively with the strong coffee until smooth. Fill cupcake liners 2/3 full and bake for 18-22 minutes, or until a toothpick inserted into the center comes out clean. Cool completely before frosting. In a large saucepan over medium heat, whisk together butter, sugar, marshmallows, and water. Bring to a boil, stirring constantly, and remove from heat. Whisk in chocolate chips until melted. Cool the frosting in the refrigerator, whisking energetically every few minutes until it reaches a spreadable texture (approximately 15-20 minutes). Frost cooled cupcakes and serve. Store in an airtight container at room temperature or in the refrigerator, depending on preference. There are a dozen or so recipes that are regarded as family recipes in my home, passed down from earlier generations. Among those held most dear are our honey cookies, which grace the dessert table when the holidays arrive, and my Grandmother Irene's orange rolls, which are made when the snow melts and stand for the hallmark beginning of spring. As I've grown older, I've quietly added a few of my mother's recipes to this coveted list, the recipes that I remember most from childhood. And that is what brings me to this banana cake. My mother originally found her recipe in an old church cookbook. Written by a friend of my grandmother, the cake had just six ingredients—sugar, sour cream, eggs, flour, baking soda, and bananas. My mother played around with the basic recipe, adding an unavoidable chocolate glaze (or chocolate chips in a pinch). Eventually shortening was added to give the cake a source of fat, which produced less of a bread-like texture and more like the feel of a cake. After I took hold of the recipe, I couldn't help myself from giving it my own twist and took it through a few more iterations before reaching this point. The spirit of the original, however, is just the same. The cake is made with shortening, which may be an unusual choice in the age of "butter is best," but I can assure you that it is the right choice. Shortening gives the cake a bit of heft, the feel of a peanut butter sandwich against the roof of your mouth, without weighing the cake down. Butter is just not capable of this texture in the same situation. The addition of sour cream and buttermilk ensure the cake has a tender crumb. It is the banana cake I remember, in its purest form. As you know by now, I can never leave anything alone for long. I filled the cupcakes with homemade chocolate hazelnut spread (though the brand name alternative would also suit). For the pièce de résistance, the cupcake is topped with a banana buttercream. A fresh banana is beat into the frosting with a little lemon juice to prevent browning. The subsequent flavor is so true and vibrant I wondered why I haven't been doing this from the beginning. Banana Chocolate Hazelnut Cupcakes is one of the evolutions of my mother's banana cake. The cake itself is rich in crumb and flavor, but the sweetness does not overwhelm. Filled with chocolate hazelnut spread, the chocolate complements, but does not overpower the subtle flavor of the banana. Topped with a banana buttercream, the banana flavor is confirmed once more, providing a light texture contrast to the cake. Preheat oven to 350 degrees F (180 degrees C). Line cupcake pan with liners. In a medium bowl, whisk together flour, baking powder, cinnamon, and salt. Set aside. In a large mixing bowl, cream together the shortening and sugars until light and fluffy. Add the eggs one at a time, beating well after each addition. Mix in the mashed bananas, sour cream, and vanilla extract. Alternatively add and beat in the flour mixture and buttermilk in 3 additions, starting and ending with the flour. Fill baking liners 3/4 full with batter. Bake for 20-30 minutes, or until golden and a toothpick inserted in the center comes out clean. Cool completely before filling and frosting. To fill, use a sharp knife (or cupcake corer) to cut out a small cavity in the center of the cupcake. I run the knife in a circular motion, while always pointing the knife towards the center of the cupcake. Aim for the cavity to be cone shaped. 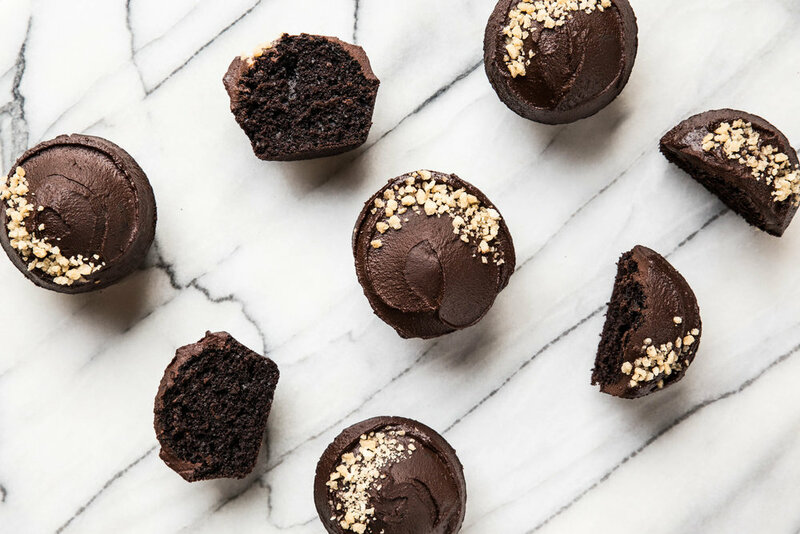 Using a pastry bag filled with chocolate hazelnut spread, fill the cupcake with the spread until nearly to the top. Cut the top off the cupcake piece you removed and press it back on the cupcake to seal the filling. In a small bowl, mash the banana with the lemon juice until very smooth. Set aside. In a large mixing bowl, beat butter until smooth. Add the mashed banana, vanilla, and salt and continue beating until uniform. Gradually add the powdered sugar, stopping once a spreadable texture has been reached. Fill a pastry bag and pipe or spread frosting on the cupcakes. Garnish with a banana chip and crushed banana chip pieces. * The banana should be ripe enough to eat, but contain no brown spots (it will stain the buttercream). If you do encounter a brown spot, cut it fully out of the banana before mashing.